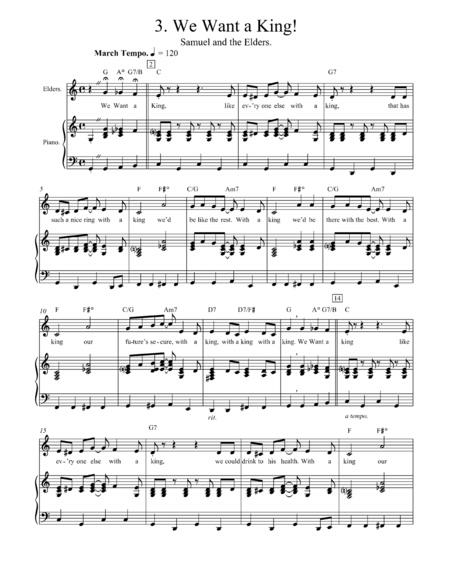 Composed by McCorkle, Dennis F. Contemporary Christian, Jewish, Broadway, Musicals, Rock. 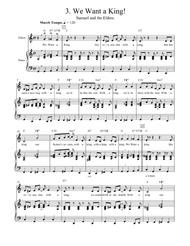 Lead Sheet, Piano Reduction. 30 pages. Published by DF McCorkle Music and eBook Publications (S0.39519). ACT ONE: Song 3. "The King," by Dennis McCorkle, is a contemporary pop-rock musical of the first two kings of Israel, Saul ben Kish and David ben Jesse and explores the contrasting lives and outcome of each man’s choices in life. [1 Samuel 8:4-5 - “4 Then all the elders of Israel gathered themselves together, and came to Samuel unto Ramah, 5 And said unto him, ‘Behold, you are old, and your sons do not walk not in your ways: now make us a king to govern us like all the nations.’”] The ELDERS, with their own agenda at heart, use the political climate and fears of the people to force a change in the governmental system. Gathering at SAMUEL’S front door, the ELDERS confront SAMUEL about his sons and demand that a king be appointed over them “like all the other nations.” [“We Want a King” – Elders and Samuel]. Also included with your order is our new 20 page catalog of over 150 titles at no additional charge.